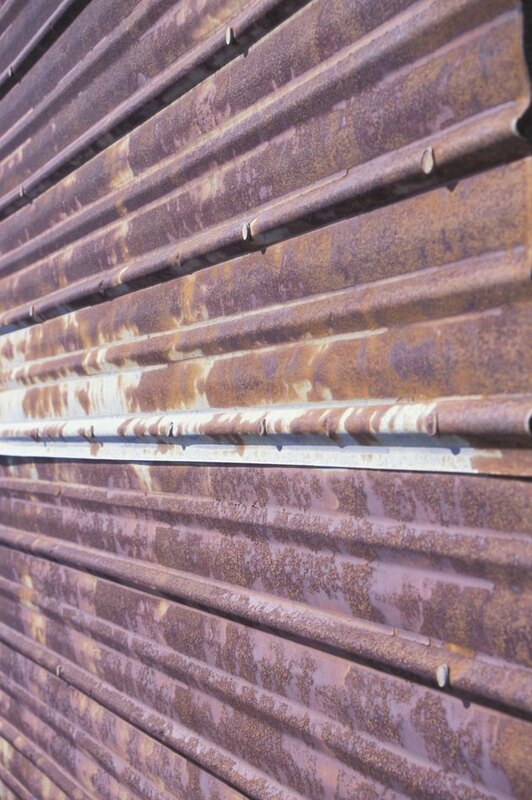 Metal roofs are prone to rust because they are constantly exposed to the elements. You can update your roof and prevent further rusting by cleaning it up and giving it a fresh coat of paint. If properly painted, the paint will not only improve the appearance but protect the roof from further rusting. A well-done paint job can last for several years. Use high-quality paint for the best results. Refresh rusted metal with new paint. Scrub the rust away using a stiff, wire brush. This will remove flaking rust and as much of the surface rust as possible. You won't be able to get all the rust off if the rust is extensive. Wash the metal roof using trisodium phosphate in water at a ratio of 1 cup TSP per 1 gallon water. You can wash it by hand, using a sprayer attachment to a garden hose or a power washer. A power washer may remove more of the rust for you. Wait for the roof to dry completely before proceeding. Apply a primer to the roof using a wider, sponge roller brush or a paint sprayer. Use a primer that is designed for metal and prevents rust. This will inhibit any more rust from spreading and will form a strong bond between the metal and the paint. Allow the primer to cure according to package instructions before proceeding. Paint your chosen paint onto the surface in the same way as you applied the primer. Use a paint that coordinates with your primer. For example, use latex paint with latex primer. It is often better to use primer and paint from the same manufacturer as they are designed to work together. Wait for the paint to cure and then apply a second coat.